Misadventures in France 2010 – Part 9 – Paris & The end! This is it, the last part of my France 2010 trip reports! Had I known how long it was going to take me to get through posting about my whole trip, I might have never started! But I am determined to finish chronicling this trip before I start posting on Japan and China. For all of you that stuck through the entire trip, you guys are troopers! I am curious whether you prefer one hellaciously long post-trip report or whether you prefer it broken up into pieces. This is the first time I did it this way and I would love to know what you think. Take a moment to answer my poll at the end of this post. 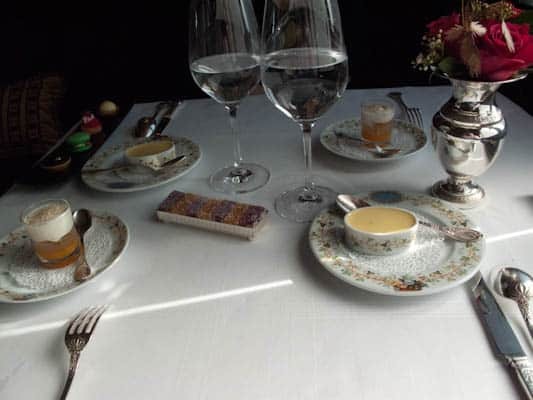 This second to last day was going to be very special because after many attempts Mr. Misadventures and I would finally be dining at Le Grand Véfour. Due to the prices and following the advice of Lindsey of Lost in Cheeseland, we decided to go for lunch where you can have the same dining experience as in the evening, but for nearly half the price. We dressed to the nines and walked over to the Palais Royale where the restaurant has been housed since 1784. 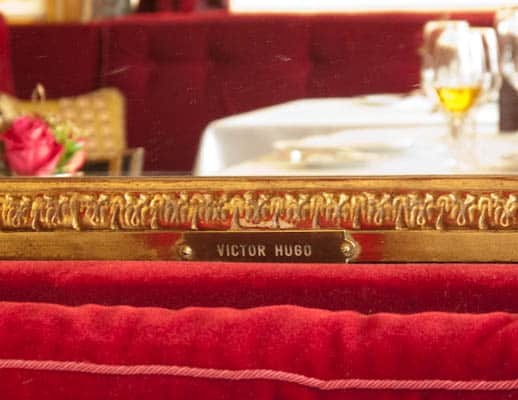 It has seen many decades of famous guests and when we arrived I was happy to be seated at Victor Hugo’s table. It was right next to the window so we could enjoy the courtyard and a view of the entire dining area, the best table for a people-watcher like me! Can I soak up the writing mojo?! The meal was amazing and I will take you through it, but I have to say this first. The food was very, very good, there is no doubt that, but my husband and I feel that San Francisco and the San Francisco Bay Area has food of the same quality. 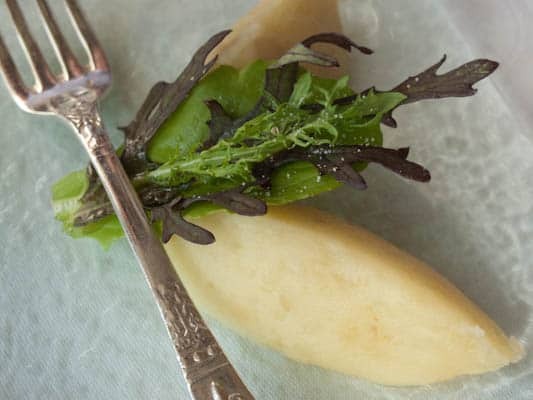 The thing that sets a restaurant like Le Grand Véfour apart is the service and attention to detail. That is the only thing that you are paying for when you go to a 2-star restaurant. 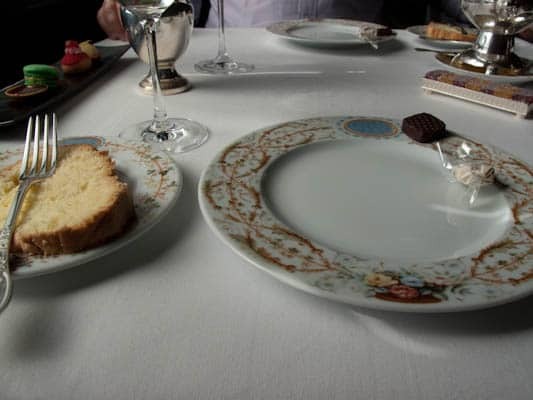 So although we thoroughly enjoyed the meal, it is not likely something we would repeat again because we can get the same quality of food for a lot less money. Now, on to the meal! Being the terrible food blogger that I am I forgot to take a photo of the second course! It was soup and it was excellent! We rolled out of there on our sugar-high and walked a bit in the hopes of burning off some of million calories we just ate. The weather was crisp, the sky clear, perfect walking and digestion weather! Our last day, we woke up late and strolled through the park. It was the end of a wonderful fifteen-day trip and my husband and I couldn’t have been happier with how our trip had gone. It was another big strike day so we took care to avoid the congested areas. In fact that is quite easy to do in France. All you have to do is go to the union website, look up the strike date and they will very diligently tell you the strike time and location and path that there demonstration will take! One stop that we had tried to get to on several trips but had not managed because it was just way too crowded was Angelina’s. This chocolate shop on the Rue de Rivoli is the spot to get a really divine cup of hot chocolate. We stopped by for an early lunch and were pleasantly surprised that we could be seated right away. Mr. Misadventures and I both selected salads prior to what we were really there for, the desserts, and were pleased with how really good they were Lunch out of the way I could not indulge in pure heaven, the house hot chocolate, or as I will forever call it, liquid heaven. To be honest hot chocolate nearly anywhere in France is excellent, so I knew I was in for a treat. The hot chocolate is good, but I could not honestly say it was so much better than most cafes. 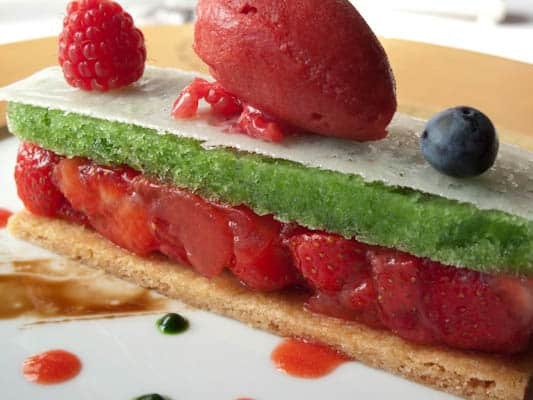 My husband had a disappointing millefeuille, likely because the one at Chateau Richieux is over-the-top good. 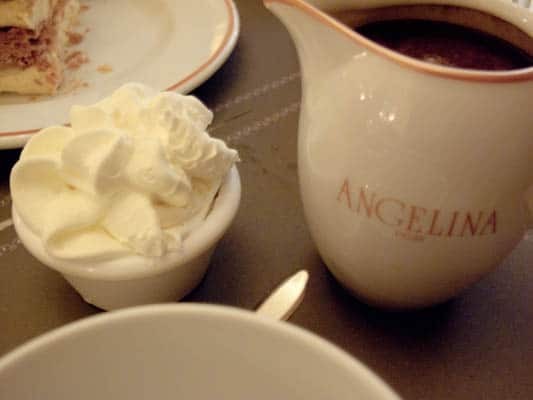 Angelina’s was a good experience, I am glad I did and I would recommend you try it at least one. We went back to the Westin to prepare our suitcases because we wanted to enjoy our last evening in Paris as much as possible. 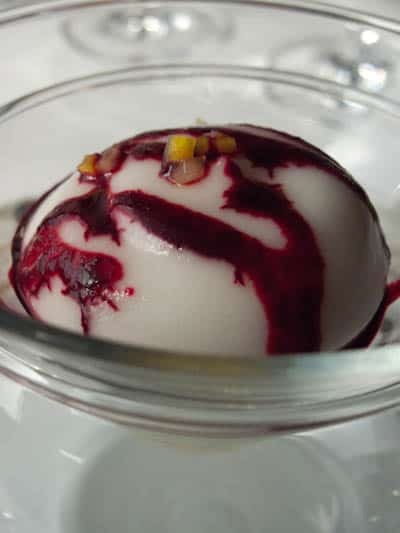 We had done a good job at trying all new restaurants and even though I tried to convince Mr. Misadventures that we could reward ourselves with a trip to one of our favorite eating spots, La Coupole, the husband was not having it. I am very thankful because we got to try another place that had been on our list, Le Soufflé. My husband had been there more than ten years before and had fond memories, it was so close to the hotel that it was a no-brainer. We walked over and headed into a lovely little salon, enjoyed a coupe, toasting to our last night, and proceeded to select our soufflés. 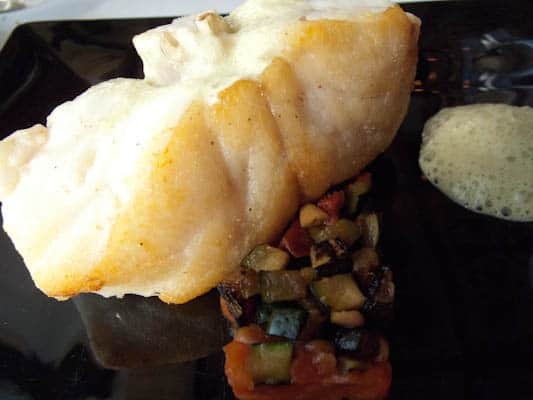 The meal is served in three courses. That is three soufflés. If you have never had soufflé, it looks deceptively light, but in reality it’s not! I had previously only had chocolate soufflé for dessert so I had no idea what I was getting myself into! Here is a bit of advice….don’t eat more that two! I selected a walnut and Roquefort soufflé as my starter. 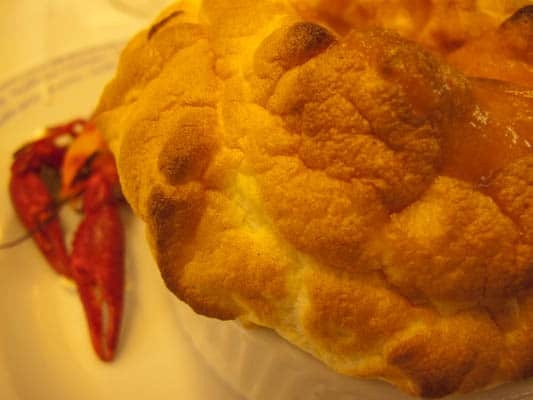 A langoustine soufflé as my main course. And a chocolate soufflé as my dessert. All three were the same size! Something inside me suggested that I should be a little conservative, so for the first two courses I left a little bit behind on my plate. Thank goodness or I would not have even been able to eat a single bite of my dessert! 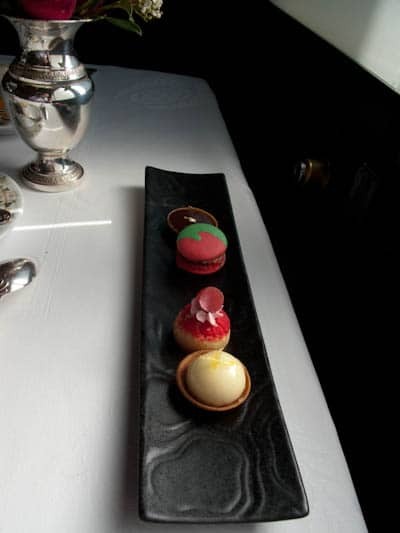 I enjoyed the meal, thought each course was very well done. The soufflés taste delicate even if they aren’t. I would have liked the chocolate one to be a little more chocolate-y, but still ate my fair share! Like Angelina’s earlier in the day, I am glad I did but cannot see myself repeating the experience too often. As the retirement strikes continued and gas for cars was becoming harder and harder to get, we worried about the taxi and bus situation. We decided to splurge and order a car through the hotel to ensure we would not have any problems when we left for the airport. The next morning we were picked up at the hotel by a nice young man who was married to an American from North Carolina and who is moving to Vancouver, British Columbia in Fall of 2011. 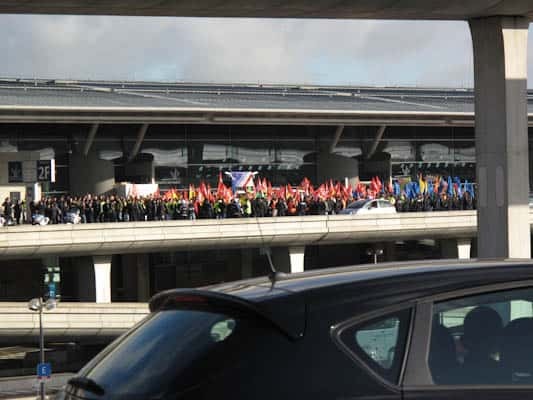 As we approached the airport, he informed us that he had heard that there were demonstrations at the airport so instead of trying to drive directly to the International terminal, he exited at the domestic terminal and drove through each one of the various buildings in order to avoid the main lane. Sure enough as he approached the two main international terminals we could see that protesters were blocking Terminal F. Fortunately, we were Terminal E and we were able to get in and unload our suitcases without issue. It seems that once again, as during our entire vacation, we had been able to slip past all of the retirement protest activities and did not impede any of our trip. And that is the end of Misadventures in France 2010. Next volume is May 2011! Interesting to hear your take on Le Grand Vefour. I’ve been debating whether to go. I’ve had similar experiences where I’ve spent a ton on one meal only to feel conflicted like I could have had three really great meals for the same price. I don’t like feeling that way, but agree it is an experience and fun to do every so often. Good idea re the poll! While I like having all the posts in one place as reference if I were to go on a trip, I do prefer a few shorter ones spaced close together as I try to get a quick read in while working. If they’re too long then I feel “guilty” like I need to get back to work. Trust me, I’d much rather be reading your blog though. @Amy75, worth doing once and then having those three dinners somewhere else another time!